Samsung has released five versions of the Android 7.0 beta firmware for the Galaxy S7 and Galaxy S7 edge, and it looks like the company could soon be wrapping testing. 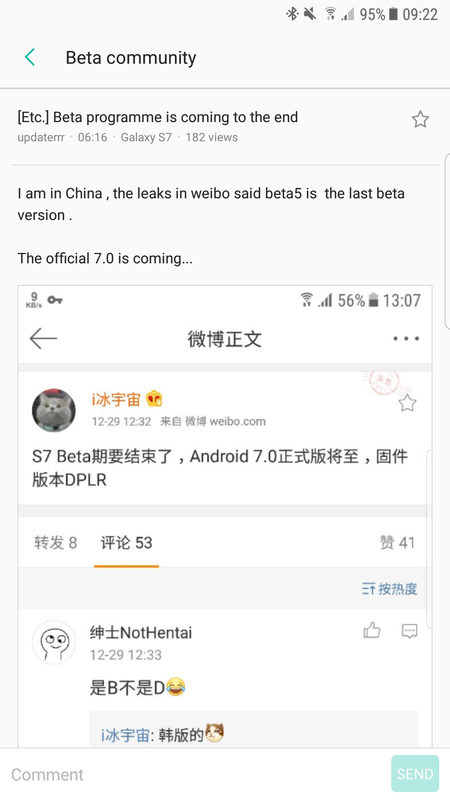 The fifth Nougat beta could be the last, according to a post on Weibo that was shared by a tester on Samsung’s beta community (found in the Galaxy Members app). Does this mean the final version of Nougat could be rolling out soon? Not necessarily, as integration of the software on a device is followed by the certification stage, so we could still be a few weeks away from the official rollout of the update. Of course, it isn’t even confirmed if Samsung has finished testing, although at this point the company really should be hurrying things up and attempting to bring the latest version of Android to its customers at the earliest. Nougat is shaping up to be one of the biggest updates for Samsung devices, and if you haven’t already, do check out our What’s New With Nougat series to find out what it brings to the Galaxy S7 and Galaxy S7 edge. It’s ending tonight. Notices have appeared and on the notice to beta testers they say they hope to have Nougat ready to install in January. It must be 7.1.1 after this long time ! I think and hope it will get it. J5 and J7 had a major update (from Lollipop to Marshmallow) so even the 2016 variant of these phones should have a major update (from Marshmallow to Nougat). Same here. Have read article about Android Nougat 7.1.1 for S7 og S7 Edge. But i read Australia Vodafone forum says some countries will update to Android Nougat to 7.1.1 or 7.0. Never started for us with an AT&T S7 with Beta Program. AT&T may release Nougat this summer since they are almost always last with updates. Got to get it to work with all their Bloatware that most do not even use. I have about had it with AT&T as a carrier. Too Controlling!!!! Thanks Samsung for removing mobile data widget toggle in beta 5. It was added in beta 4 and removed in beta 5. Last Samsung smartphone that I buy. It’s a beta. It will be probably be in the final version. You know what a beta is right? They remove parts in order to test other parts. Smh. J320FN is still running Android 5.1.1 Lollipop. I think it will not recive Nougat but It should be updated to Marshmallow. 7.0? I’ve been reading in other articles here, that it will be 7.1.1. Has it been confirmed what it will be? No matter what version number it’s going to be, The number of release date is more important. More important to get it right and as bug free as possible. I don’t mind waiting as long as it’s running smoothly. Yes, 7.1.1, but we’re just in the habit of calling the Android version by the primary number, haha. There was also some talk of the 7.1.1 confirmation being a goof-up, so it remains to be seen what happens.